BIG SALE!! 3D LASER CRYSTAL BALL $12.95 BIG SALE!! 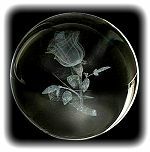 A holographic 3D Butterflies over Flowers laser image floats in the middle of a 2 1/4" wide clear crystal ball. The image is beautifully detailed and ethereal with a three dimensional view from all angles. 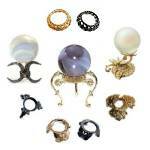 This Butterfly crystal ball is best shown on any of our LED light stands which are just $2.50 and up. A holographic 3D Hummingbird over blossoms laser image floats in the middle of a 2 1/4" wide clear crystal ball. The image is beautifully detailed and ethereal with a three dimensional view from all angles. This Hummingbird crystal ball is best shown on any of our LED light stands which are just $2.95 and up. A holographic 3D laser image of a blooming Rose floats amid a winding ribbon of 3D musical scales in the middle of a 2 1/4" wide clear crystal ball. The image is beautifully detailed and ethereal with a three dimensional view from all angles. This Musical Rose crystal ball is best shown on any of our LED light stands which are just $2.50 and up. A holographic 3D Praying Hands holding a Cross laser image floats in the middle of a 2 1/4" wide clear crystal ball. The image is beautifully detailed and ethereal with a three dimensional view from all angles. This Praying Hands crystal ball is best shown on any of our LED light stands which are just $2.95 and up. A holographic 3D Angel laser image floats in the middle of a 2 1/4" wide clear crystal ball. The image is beautifully detailed and ethereal with a three dimensional view from all angles. This Angel crystal ball is best shown on any of our LED light stands which are just $2.50 and up.